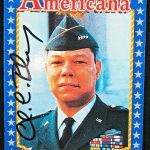 Starline Americana autographed James Doolittle #91 card. 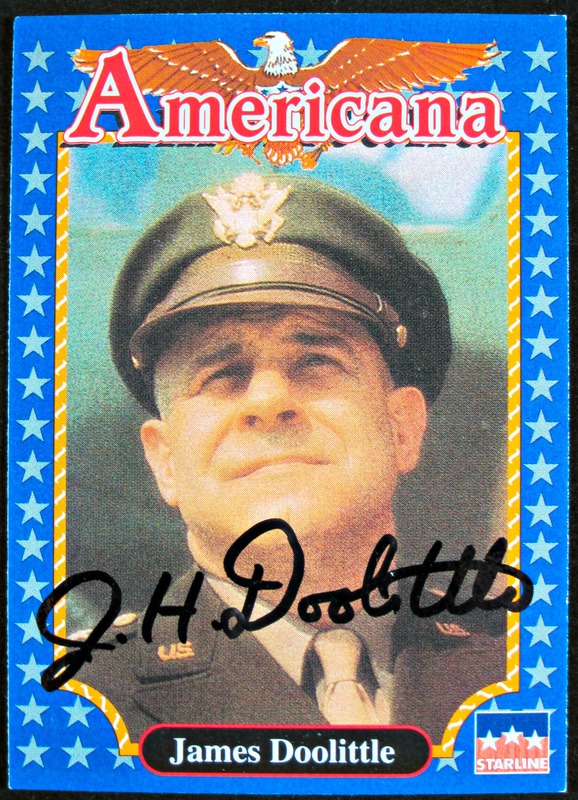 James Harold “Jimmy” Doolittle (December 14, 1896 – September 27, 1993) was an American aviation pioneer. A Reserve officer in the United States Army Air Corps, Doolittle was recalled to active duty during World War II and awarded the Medal of Honor for his valor and leadership as commander of the Doolittle Raid, a bold long-range retaliatory air raid on the Japanese main islands weeks after the Attack on Pearl Harbor. He was eventually promoted to lieutenant general and commanded the Twelfth Air Force over North Africa, the Fifteenth Air Force over the Mediterranean, and the Eighth Air Force over Europe.